This doctoral dissertation presents a synthesis of research on streets and public courts in Crete during the Proto- and Neopalatial periods. Ten sites are considered: Knossos, Gournia, Malia, Mochlos, Myrtos-Pyrgos, Palaikastro, Petras, Pseira, Sissi and Zakros. 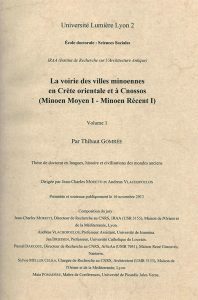 In the first volume, we propose a definition of the different elements related to Minoan streets and courts, and present an exhaustive catalogue of the currently published remains. The second volume, the synthesis, is a thematic study of all aspects of Minoan street and court systems. Here materials and building techniques are first considered. Then a typology of the streets, courts and junctions is proposed. The next chapters consist of a study of the different equipments found in the streets and courts and an examination of the morphology and dimensions of these urban spaces. Next, traffic principles are analyzed, followed by a summary of the different functions of streets and courts. The appearance of these built public spaces is discussed in the larger context of the emergence of Minoan towns, before considering their continuation following the destructions at the end of the Neopalatial period. 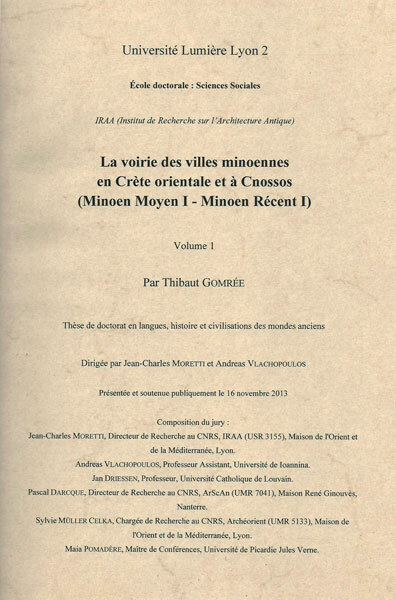 The last chapter contextualizes the role of streets and courts in Minoan society. More specifically, it considers the different clues revealed by these spaces for a more comprehensive understanding of social organization during the Proto- and Neopalatial periods.